Photography is a hobby that can make you money. At least that is what I keep reading in websites about photography! Although I have never dealt with photography, the recent poker videos I recorded and published in this blog changed my view towards photography. I have been gambling for a living, which led me to blogging for extra income and now I am looking into investing in a camera and lenses. Apart from improving the quality of my videos, having a keen interest in investing in photography generally may bring up new opportunities for income diversification. I admit that I was getting a little bored when I listened to friends talking about photography. I believed that taking photos shouldn’t be that hard and I couldn’t justify the cost of expensive photographic equipment. After 3 days of extensive research on photography I must say that I was completely wrong! Of course technology has moved on since I last held a film camera and I am surprised that digital cameras used for taking photos are actually excellent cameras for shooting videos! You may have noticed that I try uploading high-definition videos in my Youtube channel. I truly believed that my Logitech camera recorded in 720p but only when I completed the 3rd episode of the poker video series did I realize that the camera in fact enforces upscaling during the recording! That and the fact I received a couple of complains about the sound of my videos made me begin searching for an alternative solution when recording my poker sessions. Long story short I have almost decided on a Canon dSLR 60D camera and a 50mm prime lens to start with. The quality of the videos I record in the future will certainly benefit from this purchase and will probably attract more viewers and visitors to my blog, but that got me thinking. Spending a thousand euros on photography equipment just for gambling videos isn’t justified. I must take advantage of the equipment elsewhere. And that is called stock photography. In short, learning photography and spending time in this new hobby of mine will probably result to a lot of photo-shooting! Some photos will perhaps be better than others. Uploading them to a stock photography service and creating a portfolio might in fact bring a couple of sales! I’m not talking about serious money, just 20 or 30 dollars and I would be more than happy during the learning curve. This would be my first step in case I decide to invest in photography. But that’s not all. How about a blog about photography? Well, yes, I’m not pioneering here! There are thousands of good-looking blogs about photography. However, given my past experience of blogging, why not investing in a new blog as well? 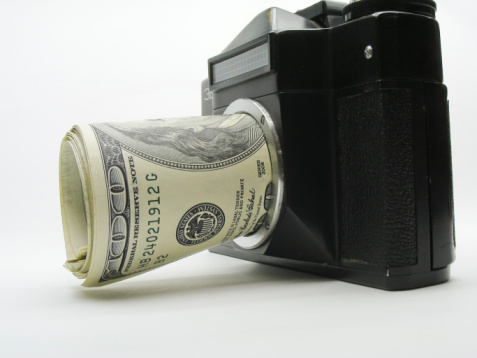 The cost of a new blog compared to the cost of the camera is truly miniscule. Therefore, why not publishing a post or two per week about what I learnt about my new toy? Did I mention the cost of advertising of “photography”? It turns out that according to Google Keyword Tool, photography isn’t such a cheap keyword. Of course it’s nowhere near the advertising cost of financial terms like stock market or trading, but there is hope for some extra income from a creative hobby. So there you have it! Investing in photography for income means stock photography and blogging for me. Should I invest in a new Canon camera, I would definitely resurrect my istockphoto.com account and install WordPress in a new domain. Until then I will keep studying about aperture, focal length and exposure! ← Poker Games Strategy Episode 4: Let them Bluff!